Ted Kaouk serves as the Chief Data Officer at the United States Department of Agriculture. In this role, he is responsible for developing strategies that enable USDA to fully leverage its data as a strategic asset, improving organizational decision-making and outcomes for citizens. Ted most recently served as Chief of Staff in the USDA Office of the Chief Information Officer (OCIO), where he provided broad leadership, strategy, communications, and administrative support for the USDA Chief Information Officer in the management of a $3 Billion IT portfolio. Mr. Kaouk started his career as a Surface Warfare Officer in the U.S. Navy. He served as a communications officer, where he oversaw a guided missile destroyer’s computer network, satellite communications suite, and cryptographic program, and as damage control officer, managing all crew readiness programs for conventional, bio-chemical, and environmental threats to normal shipboard operations and stability. Ted began Federal service in 2011 as a project manager for the Chief Information Officer at USDA Rural Development (RD). 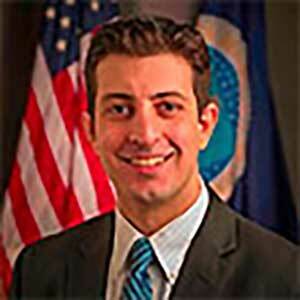 Before joining OCIO, he served in the RD Office of the Under Secretary as special assistant and program manager for strategic projects in a mission area with a $2.4 billion budget and a portfolio of $38 billion in loans, grants and other assistance spanning rural housing, broadband, utilities, and community facilities. Mr. Kaouk graduated from the United States Naval Academy with a Bachelor of Science degree, earned a Master’s from the University of Virginia, and a PhD from the University of Maryland, College Park. He is also a Senior Fellow in the Excellence in Government Fellows Program.